Immaculate 2013 custom ranch style home on over 2 1/2 acres! Private, peaceful and treed. 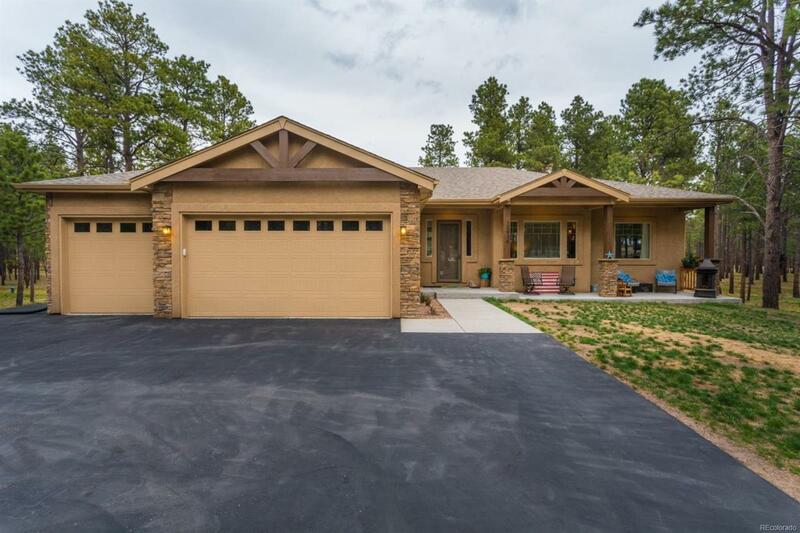 Smell the pines and fresh air in this exclusive gated community. This 5 bedroom, 3 1/2 bath, and 3 car garage home also has Double ovens and a gas range top that will delight any cook. The great room is open and inviting with a gas log fireplace, beautiful wood flooring, and amazing forest views through a wall of windows. The gorgeous curved railing is one of many custom touches you'll enjoy about this home. Spacious and bright master bedroom has attached 5 piece bath with his and her vanity sinks, large tiled shower, separate jetted tub and huge walk in closet. Two more bedrooms, large full bath, and private office complete the expansive main level. Down the curved staircase is an over sized family room, 9' ceilings, 2 more spacious bedrooms, large full bath and over 400 square feet of unfinished storage space. Easy commute to Denver tech Center and DIA.